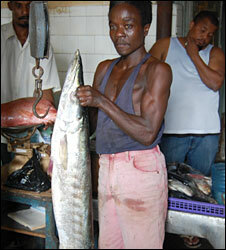 Mohammed Abdalla comes from a long line of fishermen, in a fishing village near Malindi, on Kenya's Indian Ocean coast. But declining catches mean he is seriously thinking of looking for something else to do. "I have never done anything other than fishing, that's why it's hard to give up," he says mournfully. 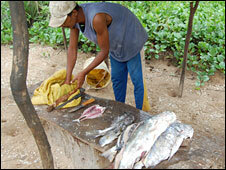 In his basket, he can only count a handful of fish, which may all end up in the family's cooking pot. Five years ago, he would have returned home with a bounty of at least 100kg of fish, all caught just within five nautical miles of the Kenyan coast. Some 20,000 fishermen along the coast are in a similar position - they are on the verge of abandoning a life-long trade, or have already done so. Marine experts warn that the catch along the 600km stretch of the coast stretching from the border with Somalia in the north to Tanzania in the south, is decreasing at an alarming rate. Kenya may soon lose the potential of producing 200,000 metric tonnes of fish annually from its exclusive economic zone (EEZ), stretching about 200 nautical miles into the Indian Ocean. Athman Seif, a director of the Malindi Marine Association (Mama), blames the trouble in the fishing industry on foreign fishing vessels operating illegally along the Kenyan coast. Mr Seif, who has been leading an almost one man crusade against illegal fishing along the coast, says the foreign trawlers mostly from Europe and the Far East countries, have taken advantage of the poor surveillance. "The Kenyan waters are virtually un-policed and the fisheries department does not own patrol boats and navy is too committed to defence matters, leaving a loophole of illegal fishing," Mr Seif said. Records at the fisheries department show that about 60 foreign vessels have been licensed to fish within Kenya's EEZ. But local fishermen associations claim to have evidence of more than 200 vessels operating in a single fishing season. Most of the ships target the prized populations of prawns, yellow fin tuna and sharks. Ahmed Shee Ahmed, the chairman of the Ngomeni Beach Management Unit in Malindi, explains that the huge presence of the foreign trawlers has forced many of his colleagues out of business. "The trawlers are depleting the fish stock, destroying the nesting areas and not to mention they also destroy our nets and despite our complaints, the government officials do nothing," Mr Ahmed, who has been a fisherman for two decades, complained. He pointed out a large number of fishing boats belonging to local fishermen currently lying in dry dock. "We no longer make money and some of us have left the trade to seek other means of earning an income," Mr Ahmed lamented. The problem of falling catches does not only affect fishing families. The lack of good quality fish means that all the best fish are sent to the main market in Mombasa, while only the poor quality ones are sold locally. Actors in the marine sector now question the government decision to licence foreign fishing vessels when it lacks the capacity to monitor their activities. Andrew Mwangura, the director of the Seafarers Assistance Programme, says most of the foreign vessels ignore the international regulations of fishing because Kenya lacks the capacity to implement. Mr Mwangura argues that the current fishing laws in Kenyan are obsolete and need immediate reforms. "For instance, any fishing vessel should have government inspectors on board but this is ignored openly because the laws are silent and Kenya does not have the personnel." Marine experts also blame high level corruption within government to the chaos in the fishing sector. They claim government officials are readily corrupted to turn a blind eye to the activities of the foreign trawlers. A report by the UK's Department for International Development (DFID), shows that Kenya losses about $5m through illegal fishing by foreign trawlers vessels each year. But newly appointed Fisheries Minister Paul Otuoma says they have opened a new chapter. "Kenya operated without a fishing policy since independence 40 years ago and this has allowed all this to happen but we shall have one by September," Mr Otuoma told the BBC. He admitted that the government is currently unable to track the activities of the licensed or unlicensed vessels at sea. "We have a few boats fitted with a vessel monitoring system and are working at plans of creating a formidable surveillance system together with the navy," Mr Otuoma explained. The minister conceded that corruption is partly to blame for the failure at the fisheries department but they have since launched a crackdown on corrupt officers. If his ambitious plans are not realised, then Mr Abdalla and 20,000 others may have little choice but to hang up their nets once and for all.